There was a moment during a usually diplomatic Spokane City Council meeting in June when Council President Ben Stuckart was especially blunt. "If we want to repeal this law, we've got to have more than anecdotes," Stuckart told Joan Medina, who does street outreach to homeless people and had come to council chambers to speak against the city's sit-lie law, saying it was targeting people who work downtown, along with the homeless. "We've got to have statistics and we've got to have the person and show that they got a ticket and that they are being wrongfully singled out. Because just saying that there's a list of people that have been targeted by this isn't enough at this point. ... We've got to have more to go on. Somebody's got to go and get a ticket and they've got to go to [Police Ombudsman Tim Burns] and make a complaint that they're an employee of somewhere downtown or they're from out of town shopping or something like that because right now I just don't have enough to go on." The council's expansion of the ban on sitting and lying on downtown sidewalks — from the previous 7 am-9 pm to 6 am-midnight — has been controversial since its passage in December. Along with some homeless advocates, Stuckart and other liberals on the council were outspoken about their concerns that it would unfairly target people with nowhere else to go, effectively "criminalizing homelessness." In the months since, opponents of the rules have testified to council often and protests have sprung up, including a group that's organizing frequent "sit downs" via Facebook. This spring, the United Nations Human Rights Committee identified sit-lie laws in a review of civil rights in the U.S., writing that, "the Committee is concerned about reports of criminalization of people living on the street for everyday activities such as eating, sleeping, sitting in particular areas, etc. The Committee notes that such criminalization raises concerns of discrimination and cruel, inhuman or degrading treatment." Meanwhile, since January, when Councilwoman Candace Mumm replaced Nancy McLaughlin on the council, the new left-leaning majority has been flexing its muscles. They've legalized backyard farming in the city, passed a series of environmentally friendly ordinances and continued to fight the Republican Spokane County Commission on growth issues. They even rescinded the previous council's opposition to the Spokane Tribe's casino project. In the next two weeks, they'll add another councilmember, one of five finalists all favored by the council's liberals. So, should we expect to see the new "supermajority" take on sit-lie? In a council committee meeting last month, Stuckart and Police Chief Frank Straub discussed the issue. A police department report to the council showed that most of the sit-lie tickets given from March to July were written in the afternoon and all of them were before 11 pm. Considering that, Stuckart asked Straub if he would support ending sit-lie enforcement at 11 pm instead of midnight to "alleviate that concern" about the law unfairly targeting homeless people looking for a place to rest. Straub emphasized that he doesn't think the law is meant to target homeless people, but "problem" groups in downtown. He still advised against a change. "My counsel would be not to do that because probably what'll happen is it'll move back and the activity will start and we'll be in a position where we have to push it back again," Straub said. "People tend to adjust themselves to policing action, so my concern is if we dial it back, they'll adjust themselves." The council has also received a letter from Downtown Spokane Partnership President Mark Richard warning against changing course on sit-lie. 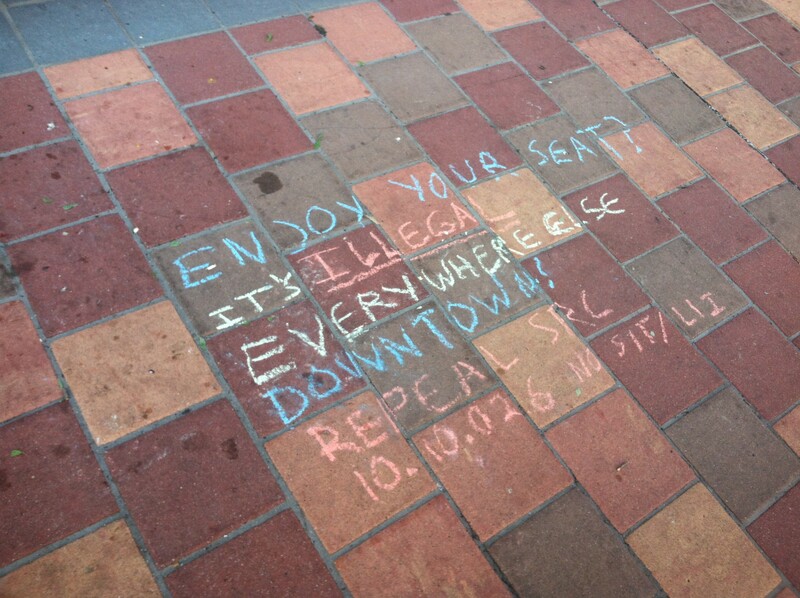 While pledging support for "providing services to those who are willing to accept them," Richard wrote that an effort to change sit-lie would be "counter to the pledge I received from Council this winter; that you would not seek to repeal these changes with the new make up on the council." "Is this ordinance perfect; no, and it never will be," Richard wrote. "We remain as committed as the day it was passed, however, to reviewing it and ensuring it is used as a positive tool; replacing fear with a feeling that every human being of all walks are welcome in downtown. ... If it is revoked, we have every reason to believe you will embolden the group that continually violates the law like never before and we will be hard pressed to gain back a mutually respectful sidewalk experience. My point is this; we can ill-afford to go backward." Late last month, Stuckart told the Inlander he's not planning to push for a reversal of the law or a reduction in the hours it's enforced. "They're not out there ousting homeless people at 11:30, which was my concern," he says. "I haven’t seen specifics that that’s happening. I can’t reverse the law on a couple stories." Stuckart also said he expects some sort of lawsuit over the ban in coming months: "We'll let the courts rule on whether it's unconstitutional or not." Spokane City Council signs off on "parklets"